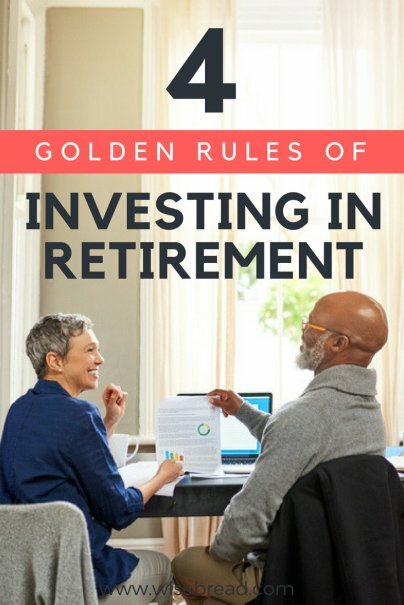 After you've spent a lifetime investing for retirement, it can feel very different to invest in retirement. Many retirees are hesitant to start withdrawing from the nest eggs they've carefully built over the years. And, they sometimes feel especially nervous about managing that account, knowing it needs to last as long as they do. Thankfully, there are some guidelines that can help. Here are four golden rules for investing in retirement. Longevity is increasing. Your retirement could last for two decades or more. According to the Social Security Administration, a 65-year-old man today can expect to live to nearly age 85. A 65-year-old woman today can expect to live past age 86. And those are just averages. Many people will live well into their 90s. This reality is reflected in many of today's target-date funds. For example, Vanguard's Target Retirement 2020 fund, which is designed for people right on the cusp of retirement, currently has 54 percent of its assets invested in stocks. The lowest level of stock exposure Vanguard's target-date funds ever hit is 30 percent, which occurs seven years after each fund's target date. Thereafter, it remains fixed. By the same token, you can't afford to get carried away with risk. With the current long-running bull market showing few signs of running out of steam, it may be tempting to take on more risk than you should, especially if you feel somewhat behind on your retirement savings. But that would be dangerous to your portfolio and your peace of mind. Instead, trust the rules of asset allocation. If your optimal asset allocation calls for a 50/50 stock/bond mix, stick with that. One day, the bull market will end and you'll be glad you weren't invested any more aggressively than you should have been. If you're not sure what your optimal mix should be, Vanguard's asset allocation questionnaire can help you figure it out. 3. Consider maintaining a cash "bucket"
One of the biggest threats to your portfolio in retirement goes by the fancy name of sequence of returns risk. That refers to the possibility that the market could fall just as you enter retirement. While the market naturally ebbs and flows over time, a significant downturn right at the start of retirement can put a strain on your cash flow throughout retirement. Especially if you lean toward the conservative side of the risk spectrum, one way to manage that risk is to implement the bucket strategy — creating a cash account containing two to three years' worth of essential living expenses. That can help you avoid having to withdraw from your investment account in a bear market. Within many marriages, there's a division of labor, with each spouse taking the lead in different areas. If one of you has been managing the investments, now is the time to bring the other into the process. Otherwise, when the investment-manager spouse dies, it can leave the surviving spouse ill-equipped to take over. One of the sweetest rewards of a life lived well is peace of mind in your later years. When it comes to experiencing financial peace of mind during retirement, the four steps described above should help.